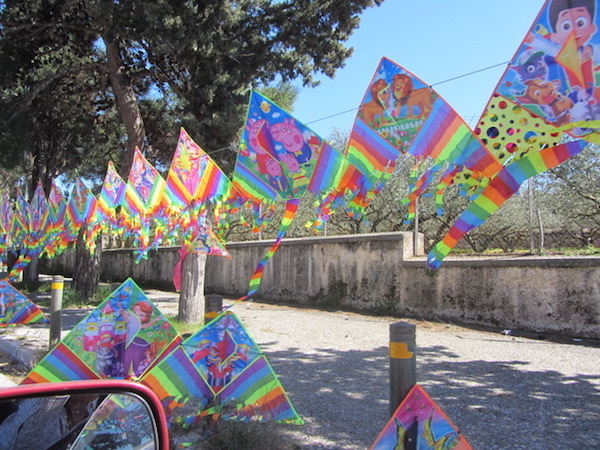 Sidewalks turn into kite bazaars all over Athens for Clean Monday. 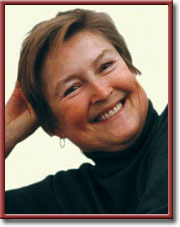 Editor’s Note: A version of this column originally appeared in Weekly Hubris as “My Vegetable Love” in March 2010. ATHENS, Greece—(Weekly Hubris)—April 2019—I’m writing just after the last weekend of Carnival in Greece, which comes to a close not with an Ash Wednesday but with a Clean Monday. This gives Greeks three days on which to celebrate rather than just a single Fat Tuesday. And it seems to me that, despite all the parades and pranks of Carnival, what people love best are the foods and customs of the beginning of Lent. Clean Monday (Kathara Deftera) has nothing to do with Ash Wednesday, though it is often referred to as Ash Monday. Solemnity, smudged foreheads, penitence, even church have no place in the Greek Orthodox schedule of events. Instead, it’s an occasion for Greeks to head for the countryside with their kites and an elaborate picnic. But even if they stay at home, it’s a day that is dedicated to feasting. All weekend, crowds besieged the shops and markets for fasting treats and this year the Central Market in Athens was open for more than 24 hours straight, from all day and most of Sunday night to about 3 p.m. on Monday. The spectacle on TV was unreal, comparable to Black Friday in the US or Boxing Day sales in the UK, but food was the only commodity exchanging hands. We watched as some fishmongers, surrounded by hordes of shoppers, dangled octopus tentacles and crab claws, while others dug into mounds of red shrimp and glistening black mussels. A similar scramble might be seen in America on the Wednesday before Thanksgiving, and the two holidays do share some common features. Both come with no strings attached in the form of presents. All that’s required is good company and a perhaps excessive amount of good food. And, like Thanksgiving, the dishes almost always represent a communal effort, with no one person, certainly not the hostess, slaving all alone over a hot stove. In addition, certain dishes are de rigueur, absolute musts established by centuries-old tradition. But there the comparison stops. For while Thanksgiving dinner tables groan under the weight of butter-basted turkeys, sausagey stuffings bound with eggs, giblet gravy, cream-napped onions, milky mashed potatoes and a range of vegetables slathered with more butter, Clean Monday fare adheres to strict Orthodox fasting rules. No food that is in any way connected to an animal with blood running through its veins may pass Greek lips. So, not only are meat and poultry excluded, but also milk, butter, eggs, yogurt, cheese and even fish. Greeks tend to be lax about observing many laws, but few would be found gnawing on lamb chops or even nibbling that usually ubiquitous slab of feta on Clean Monday. Many of them may continue to eat meat for the rest of Lent but the habit of this one-day abstention is too ingrained to break. Does this sound too dreary for words? Wait a second. Here is a typical menu for this very special celebration: fluffy taramosalata, flecked with spring onion and redolent of lemon; oysters and clams on the half shell; mussels steamed with garlic, parsley and white wine; octopus, grilled, vinaigrette, stewed . . . with tomato and a cinnamon stick or fennel and green olives; cuttlefish ragout with spinach and dill; shrimp, langoustines, lobster . . . just for example. Luckily, all these delectable fruits of the sea are “bloodless” as well as spineless. Not as luxurious but certainly very palatable are the accompanying array of dips and casseroles: hummus and pureed yellow peas (fava) topped with sweet, crunchy onion rings; smoky eggplant puree, baked giant beans, lentil salads spiked with chili pepper, a host of lettuce combinations, boiled wild greens . . . all glistening with fragrant olive oil. And even tastier when scooped up with a slice of lagana, a sesame-sprinkled, platter-sized raft of unleavened bread. 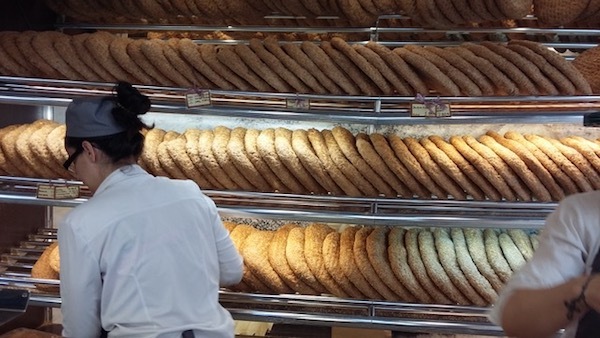 Racks of lagana at the local bakery. With the help of wine or ouzo poured from seemingly bottomless jugs, the feasting lasts from noon to past sunset, interrupted only by the occasional urge—on the part of the young and young at heart—to go fly a kite. Indeed, that’s the one string attached—pardon the pun—and although it is said that the kite represents the soul attempting to reach God, cleansed and liberated by gusty March winds, it’s doubtful that any kite flier actually knows this or even cares. Almost a decade ago, we found ourselves in Paris on Clean Monday. 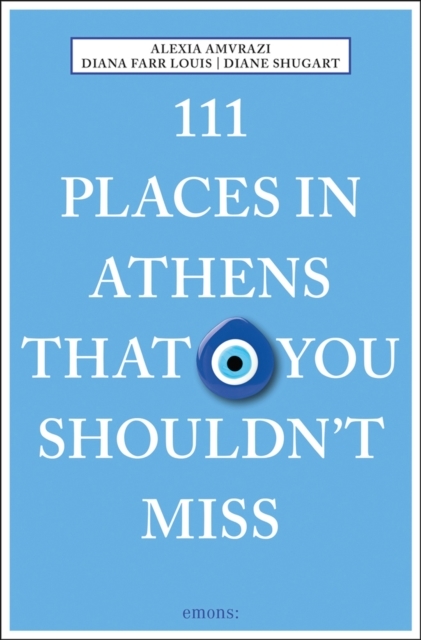 Strange as it might seem, I had many pangs of nostalgia when I realized I would miss it in Greece. Well, yes, I did get over them and we made daily pilgrimages to the market, started the mornings with ethereal croissants, had our fair share of seafood, and soaked our baguette slices in pools of emerald green garlic butter after struggling with snails. We also dined out on roast lamb, andouillette and blanquette de veau, lest you think I am not a carnivore, But, although gorgeous looking vegetables and every kind of lettuce adorn even lowly Parisian supermarket displays, they rarely appear on restaurant menus. A sprig of parsley may be as close as you’ll come to greenery. After five days of bread and cheese, steak and frites, we took the bullet train down to Marseille to visit friends. The very next day, they took us to a famous seafood place and treated us to mountains of oysters followed by bouillabaisse. And I in turn made them some Greek vegetable dishes when we ate at home. 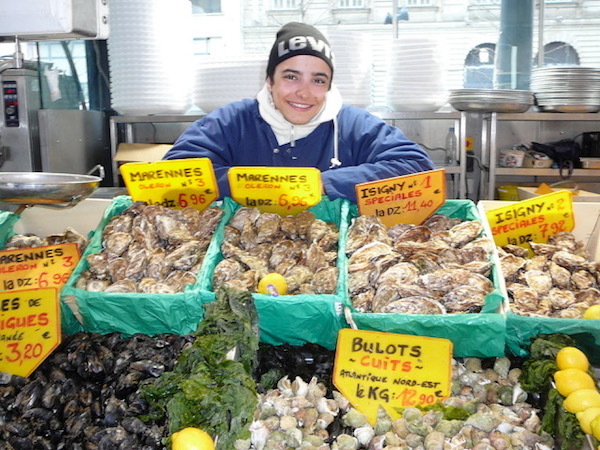 There’s no shortage of seafood in France. But it was not so much the Lenten fare that I missed. It was the whole festive atmosphere. I wonder if anywhere else in the world, besides possibly Cyprus, people wish each other “Kalo Koulouma”—a word whose meaning is obscure but refers solely to the open-air partying of Clean Monday—and when that’s over, they wish each other “Kali Sarakosti,” or Happy Forty Days (i.e. Lent). Elsewhere in the Orthodox world, Monday seems to be a day of total fasting. Here though, it ushers in the spring and 40 days of utterly wonderful vegan stews, dips, and casseroles, the result of generations of women devising brilliant ways of keeping their families happy and healthy before the more conventional meat-based feasting of Easter. Octopus without the fennell and green olives. This was one of my very favorite recipes for octopus. It comes from Chania, on Crete, and has been adapted from my book, Feasting and Fasting in Crete. I say “was” because, after reading Sy Montgomery’s The Soul of the Octopus: A Surprising Exploration into the Wonder of Consciousness, I am no longer able even to contemplate the possibility of licking a tentacle. But for you who are not so conscious-ridden, I promise this is delicious. It seems to me that octopus, fennel and green olives is one of the great marriages, even if it is a menage à trois. It is also another of those dishes that should be made a day ahead to give these three strong tastes a chance to harmonize. When I was testing it in our Andros kitchen, our guests approached it dubiously for, being dark in appearance, it is not instantly mouth-watering. But they kept coming back for more—“to find out what made it so good”—until the bowl was wiped clean. You could serve it as an hors d’oeuvre scooped up with slices of country bread, as a first course, or even as an exotic spaghetti sauce. And don’t be deterred if you can’t find wild fennel: bulb fennel makes a very delicious substitute. If you buy a frozen octopus, simply defrost it, wash it and then boil it in a covered, non-stick saucepan over medium-low heat without adding any water. If it’s fresh, have the fishmonger clean it. Fresh or frozen, it will cook in its own juice, but if it stops exuding liquid before becoming tender, pour in a little of the wine. As it starts to reabsorb its liquid, you have to watch the pot closely or risk the beast sticking, so add the wine before this can happen. 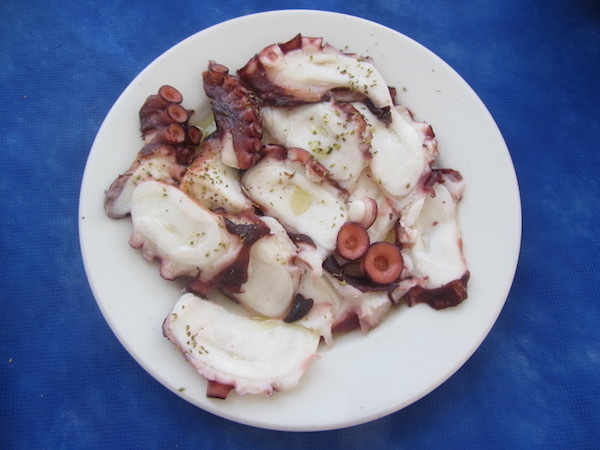 When the octopus is tender, remove it from the saucepan and cut into bite-sized pieces, removing the eyes and beak. Adding the oil to the saucepan, gently sauté the fennel and parsley for a few minutes before you return the octopus pieces with the rest of the wine. Simmer until you have a thick sauce. Stir in the olives and cook another 10 minutes. Do not add salt when you cook octopus and check the olives for saltiness. You might want to soak them in lemon juice diluted with a little water while you’re preparing the octopus to make them tastier and less salty. 3 Responses to Happy Lent! Thank you, Diana, for choosing this particular piece to re-tell! I love how you present a kind of austerity in the delicious abundance, and remind us (gently) that there are so very many ways of healthy indulgence. And your writing is always so clear and filled with life. You had me entranced all the way through your wanderings and your words . . . but then, there appeared the recipe for octopus! Glory! Cannibalistic queasiness aside, octopus remains one of my rarely-indulged but frequently-craved tastes. What a feast!